The Providence Stadium will be the battle ground from 09:30hrs today as four-times Champions and tournament leaders Guyana Jaguars with 58.4 points from three wins, will face-off with third placed Windwards Volcanoes, on 38.2 from two wins and a loss in what should be a competitive encounter. The Windwards beaten Guyana in over six years and the last time they met in the first round in St Lucia, Jaguars won be 125 runs. 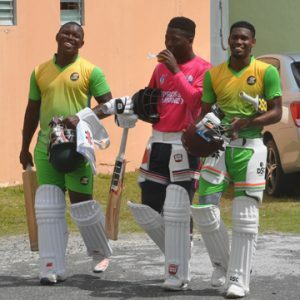 Jaguars made 224 in their first innings with Vishaul Singh (75) and Romario Shepherd (44) contributing with the bat as Shane Shillingford had 4-59. Alex Athanaze (64) and Taryck Gabriel (57) got fifties to help Volcanoes to 222 in response as Veerasammy Permaul took 3-56. Led by an unbeaten 84 from 334 balls from Tagenarine Chanderpaul, 69 from Clinton Pestano and 51 from Skipper Leon Johnson, Jaguars declared at 310-4. Only Athanaze (34) offered meaningful resistance as Pestano had 4-46 and Permaul 3-13 as the host were bowled for 187. Today both teams will be missing their top performers from that match since Shillingford has been banned for an illegal action and Singh, along Chanderpaul Hemraj and Raymon Reifer will miss today’s game since they leave for Barbados to participate in two two-day matches against England. Regional runs machine Devon Thomas asks Head Curator Habib about the Providence track. Volcanoes will be without Sunil Ambris for the same reason but both Coaches said that while those players will be missed today, they are confident that those in the side can get the job done. Hemraj scored his maiden ton and Reifer had five wickets and made 90 runs including a first innings fifty in the last round. Singh, Hemraj and Reifer will be replaced by the Test pair of Shimron Hetmyer and Kemo Paul, while Trevon Griffith also comes back into the team. Jaguars Manager/Assistant Coach Rayon Griffith informed that Devendra Bishoo is still recovering from injury and has returned from the USA. 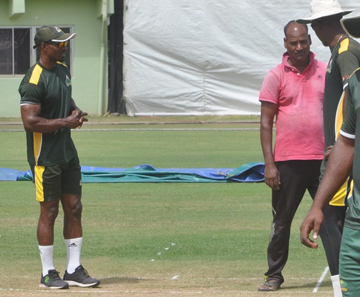 “We are without four of our players who have played Test and they will be missed, we have a group of hungry young players who can get the job done,” said Griffith, an ex-Guyana pacer. 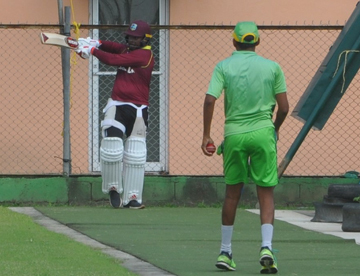 Head Coach Esuan Crandon, who leaves after this round to take up duties as Windies Assistant Coach, says in this game he wants the batters to capitalise on good starts and score big hundreds. “Winning our first three games on the road is a tremendous start for us coming back home to play (today) tomorrow in conditions that we know and own,” informed Crandon. Sherfane Rutherford about to stop the ball during fielding drills. Guyana batting has depth but they would hope that Chanderpaul rotates the strike a bit better and not soak up as much dot balls as has been done during this tournament and that Griffith, Johnson and Barnwell be more consistent. The return of Hetmyer and Paul adds fire power to a line-up that includes Anthony Bramble, Rutherford and Pestano. Their bowling will be taken care of by Permaul, whose 20 wickets are the most by any bowler in the tournament with pace support from Shepherd, Pestano, Barnwell and Rutherford. On a track with looks to be well suited to spin, the Jaguars’ could toy with the idea of including Gudakesh Motie. The Volcanoes will depend on 37-year-old Regional run-machine Devon Smith who did not play in the round. The left-handed Grenadian has scored 35 centuries from 202 matches since playing his first in 1989. His highest score of 212 was made against Guyana whose bowling has been very successful. 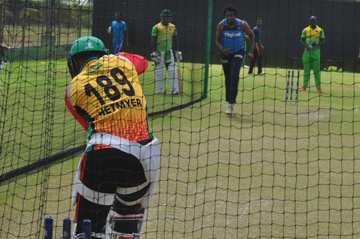 Asst Coach Rayon Griffith watches as Shimron Hetmyer defends against Andre Stoll during a net session yesterday. Kavem Hodge, while the bowling will be led by Ray Jordon and left-arm pacer Obed McCoy, while Larry Edwards should enjoy the Providence track. According to Volcanoes’ Assistant Coach Fenix Thomas, the former Windwards pacer who along with T&T pacer Mervin Dillion was struck by lightning during a Red Stripe Bowl game in 2003 in Jamaica, their bowling is their strength but especially with the presence of Smith their batting is also strong. Volcanoes warm-up with a game of Football. He said that while Shillingford has always done well for the Windwards in the past and will be missed, the Volcanoes beat Jamaica in Jamaica without him. 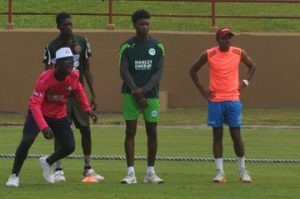 “While the pitch looks the usual Guyana pitch which should off assistance to the spinners, Devon has done well against them. When you look at Devon Smith you see centuries,” the Dominican stated. 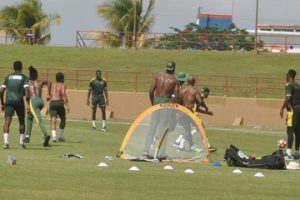 He said Guyana has dominated everyone and will be respected but added that the Volcanoes should have won the game in St Lucia and anticipates a keen contest and that winning away from home gives the team confidence. 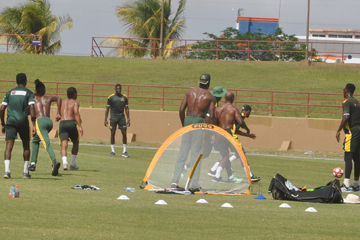 “I encourage the Guyanese to come out to see four days of competitive cricket,” Thomas concluded. Test players Chanderpaul Hemraj (batting) and Vishaul Singh will miss today’s match.